The diminutive capital of tiny Liechtenstein, Vaduz offers quite an interesting array of attraction to its visitors. With this article, know the different things to do and places to see in Vaduz. The sleepy little city of Vaduz is the capital of the principality of Liechtenstein, one of the smallest states in the world. Ideally situated on the banks of River Rhine, Vaduz is home to about 5,100 inhabitants, most of them being Roman Catholic. With so many must-see attractions and things to do, one can never get bored in Vaduz. Talking of tourist attractions, Vaduz extends massive castles, heritage sites and exciting outdoor activities. What more can one ask for, when in this delightful city? Additionally, a walk through the streets of royal Roman vestiges or a visit to the museums should not be given a miss to discover the undiscovered in this tiny capital city. With such fascinating and breathtaking tourist spots in Vaduz, one can only think of taking out time to breathe a second. Next time, when you plan your vacation to Switzerland, Austria or any other European destination, do not forget to make a brief stopover to the secluded and vibrant city of Vaduz to record this visit in your passport. The medieval understated fortress of Vaduz, Vaduz Castle, located on the outskirts of the city, forms the central landmark of Vaduz revealing the town’s rich history. 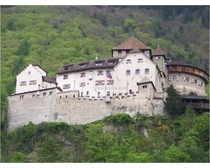 Also referred to as the Prince’s Castle or Schloss Vaduz, this massive stunning castle is the official residence of the Prince of Liechtenstein. Though the tourists are not permitted to enter the premises of the castle, one can definitely climb up to it and catch a glimpse of the magnificent views of the Vaduz city underneath. This 19th century parish church was built by Friedrich von Schmidt to honor the 9th century saint, Florinus of Remüs. However, in 1997, the Cathedral of St. Florin, commonly known as Vaduz Cathedral, was given the status of a cathedral. The neo-gothic architecture that Vaduz is popular for can well be seen in this church as well. The Liechtenstein Art Museum is a must-see for all tourists who think that their visit to Vaduz is uninspiring. This state museum will definitely turn your dreary and lackluster journey into a worthwhile and enjoyable one. Wondering what’s so special about this place? As you draw closer the museum, the building will mesmerize you with its polished dark concrete. Within the interiors is a rich collection of international modern and contemporary art. The 19th century styles, like cubism, minimalism and surrealism, are evident from the masterpieces of leading artists, namely, Hans Arp, Salvador Dalí, Henry Moore, Pablo Picasso and Donald Judd. Built between 1932 and 1933, the City Hall is a lovely contemporary building, pink in color. The long row of windows and balconies are ornamented with marvelous frescos. The three bronze statues of the wild horses resting in the premises are the main highlights of this attraction. All wine lovers are going to thank their itinerary maker for including Vaduz in their European extravaganza! The fine wines, right from the Prince of Liechtenstein's wine cellars, are an absolutely unforgettable experience. Accredited with numerous awards and prizes, these world-class wines will retreat you into the world of coziness and relaxation. The 12 signs listed along the wine trail update you about the wines through words and illustrations. How about picking one princely gift for your loved one?